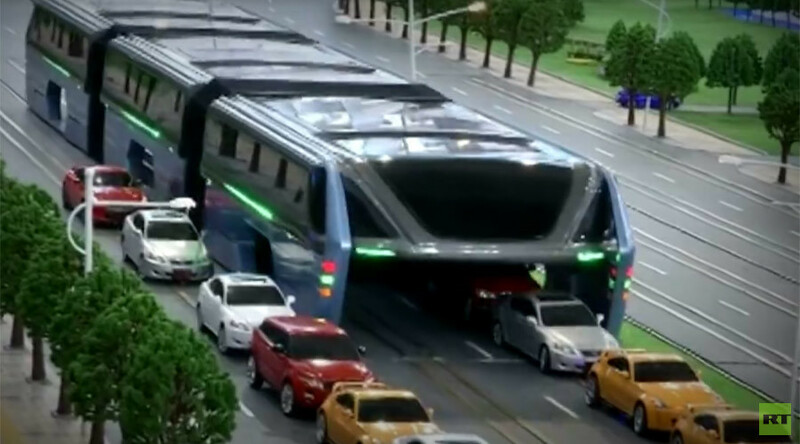 China has unveiled an impressive futuristic ‘uber-bus’ that can carry 1,200 passengers, travels above other vehicles, and aims to end the nation’s notorious traffic jams. The Transit Elevated Bus (TEB) is essentially a metro system that hovers above cars and was designed to maximize the use of road space. The revolutionary mode of transport was revealed to the public at the China Beijing International High-Tech Expo over the weekend. Designers in China claim the innovative transport system should be both cost-effective and environmentally friendly. The elevated high-speed bus is powered by electricity, which is supplemented by solar energy generated by the roof panels. “With a carrying capacity of 1,200 people at a time, the TEB has the same functions as the subway while its cost of construction is less than one fifth of the subway,” senior project engineer Bai Zhiming told CCTV News. Shenzhen Huashi Future Parking Equipment, the company behind the TEB, say construction can be completed in a year. Trial operations are due to start in Qinhuangdao City, in north China's Hebei Province, in the second half of 2016. China’s TEB is just one of a number cutting edge developments set to transform the future of the transport industry and which leave Doc Brown’s time-travelling DeLorean looking somewhat mundane. AeroMobil and Terrafugia are among the companies vying for take-off with their flying cars in 2017. ‘Lilium,’ the first-ever vertical takeoff and landing aircraft for personal use, is expected to be available from 2018. It is currently being developed by a start-up company in the European Space Agency’s business incubator. Meanwhile, billionaire Elon Musk plans to introduce a ‘fifth form of transportation’, with testing for the high-speed Hyperloop scheduled for 2020. The Hyperloop could take passengers on a 700 mph (1,126 km/h) journey in capsules propelled by magnets between three European cities in just minutes.